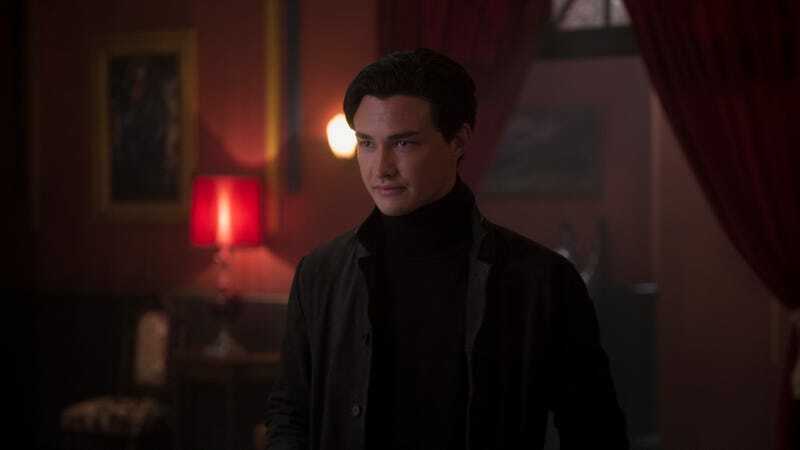 Nicholas (Gavin Leatherwood) leers in the halls of the Academy of Unseen Arts, which features Clive Barker’s original artwork. Hail Satan! Netflix’s The Chilling Adventures of Sabrina is full of nods to famous horror works like Suspiria and Hellraiser through its creatively terrifying set design, but it’s not limited to mere tributes. Clive Barker, the horror visionary behind Hellraiser and Candyman, has contributed over 150 paintings to grace the walls of Greendale’s bewitching academy. During a recent set visit to The Chilling Adventures of Sabrina, production designer Lisa Soper told me how most of the artwork in the Academy of Unseen Arts—Greendale’s mysterious and dangerous magical school—came courtesy of Barker himself. Soper said she befriended Barker thanks to her work on Sabrina, and chatted with him about the project and her plans for the set design. According to Soper, Barker was immediately on board to help out. “We spoke about kind of the idea and the themes behind what we were doing here and he said, ‘Why don’t you come down, spend the weekend, take a look through all the artwork and pick out what you want?’” Soper said. Barker may be best known as the writer and director of Hellraiser—the classic horror film based on his novella The Hellbound Heart—but he’s a hell of a lot more than that. He’s an accomplished horror writer, known for his beloved Books of Blood and Arabat series, and he’s also an acclaimed artist whose works have been featured in galleries across the country. And now, it’s been immortalized in the Academy of Unseen Arts. Soper said they’ve amassed a collection of 150 of Barker’s works, which they change over depending on what room of the Academy they’re filming in. Since the school is designed to be a series of identically shaped rooms, designed after the practice of Sacred Geometry, they only needed to build one interchangeable set for a majority of the rooms. In a sense, Barker’s art is one of the main variables in the magical school’s sea of constants, casting a watchful and horrific eye over the goings-on. Soper said she’s still trying to coax him to the set for a visit, or a possible cameo as a teacher. The Chilling Adventures of Sabrina haunts audiences on October 26.